By NC Courage Communications, 03/29/19, 1:00PM. CARY, N.C (March 29, 2019) – The North Carolina Courage will host the 2019 edition of the Women’s International Champions Cup (ICC) August 15-18 at Sahlen’s Stadium at WakeMed Soccer Park, Relevent Sports Group (RSG) announced today. The Courage enter the tournament as defending ICC champions with La Liga Iberdrola’s 2018 champion Club Atlético de Madrid Femenino, 2018 UEFA Champions League semi-finalist and 2018 FA Women’s Super League runner-up Manchester City and five-time UEFA Champions League champion Olympique Lyonnais Féminin of the French D1 Féminine also joining the tournament. The format of the tournament will be similar to the 2018 edition with semifinal matches on Thursday, August 15, and third place and final matches to take place on Sunday, August 18. Club Atlético de Madrid enters the tournament as the 2018 champion of La Liga Iberdrola and is on its way to repeat for the third consecutive time. The club is led by Jennifer Hermoso who has scored 21 goals so far this season. Brazilian rising star Ludmila has also contributed to the club’s prolific offense, while Spanish goalkeeper Lola Gallardo anchors a defense that has only conceded 17 goals in 25 games this year. 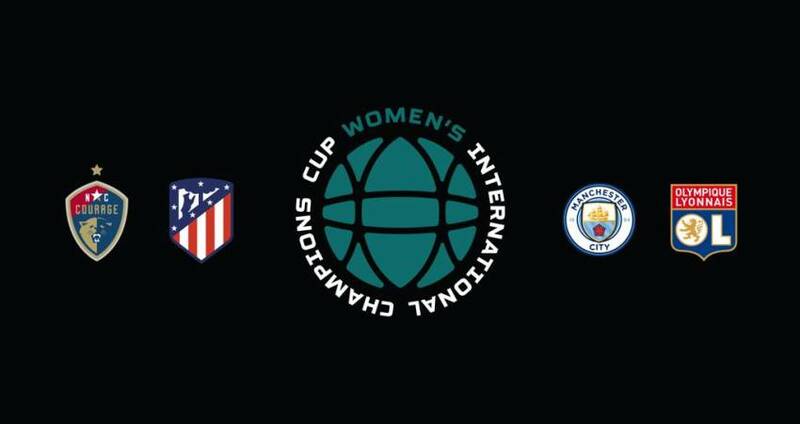 Currently sitting in second place in England’s Women’s Super League standings, Manchester City WFC boasts a roster full of England National Team players. They are led up top by English duo Nikita Parris and Georgia Stanway who have combined for 39 of the 49 goals scored by the team this season. The club will be participating in the tournament for the second time, after finishing third in last year’s ICC. Arguably one of the most decorated women’s soccer clubs in the world, Olympique Lyonnais returns to the tournament for a second time and boasts a record-setting 16 French titles and six French Cup trophies in addition to the aforementioned five UEFA Champions League titles. Their roster is comprised of a who’s who of European Soccer, including inaugural Ballon d’Or recipient Ada Hegerberg, who leads the team with 18 goals scored this season. The side also includes former Portland Thorns midfielder Amandine Henry, former UNC defender Lucy Bronze as well as French star Eugenie Le Sommer. The Courage will certainly have a target on their back when entering the tournament. The 2018 NWSL Champions won the inaugural tournament in 2018 by defeating Olympique Lyonnais 1-0 last July in Miami, behind a goal by Heather O’Reilly. Head coach Paul Riley retained the majority of the championship team, including USWNT stalwarts Crystal Dunn, Abby Dahlkemper, Samantha Mewis and McCall Zerboni while adding key pieces to the squad, including Canadian goalkeeper Stephanie Labbé. Women’s ICC matches will be broadcast on ESPN. Tickets will be available later this spring on the ICC website. Please follow @WomensICC on Instagram and Twitter as well as @NCCourage.com for ticket sales announcements. Relevent Sports Group (RSG) is the premiere soccer events and media business in North America and Asia. RSG operates the International Champions Cup, the summer’s largest club tournament featuring the world’s best teams in iconic venues. Regarded as one of the most influential privately-owned soccer companies internationally, RSG is focused on expanding its footprint, creating a year-round soccer platform including new properties, the ICC Women’s and Futures tournament, Alianza de Futbol, the leading marketer and producer of Hispanic soccer programs in the U.S, and the first-of-its-kind joint venture with La Liga to promote soccer in North America. The North Carolina Courage are the reigning champions of the National Women’s Soccer League (NWSL) as well as winners of the 2018 Women’s International Champions Cup. They are part of North Carolina Football Club, the largest youth-to-professional soccer organization in the country, which includes a men’s Second Division team, North Carolina FC (USL Championship), and a development team, North Carolina FC U23 (USL league Two). The organization is also home to both Boys and Girls U.S. Soccer Development Academies in collaboration with NCFC Youth, effectively creating a true pyramid from youth recreational all the way to the professional teams. The North Carolina Football Club is owned by local entrepreneur, Steve Malik, and managed by North Carolina native and longtime soccer executive Curt Johnson. North Carolina Football Club was established in 2016 to bring the highest levels of men’s and women’s professional soccer to the state. For more information, please visit www.NCCourage.com. View the release from NC Courage Communications, here.